Do you see a #? I am color blind. I've known this since I was a kid and first got my eyes checked (thanks mom and dad! or more correctly, thanks Mom and grandpa!). I can remember that time sitting in the optometrist chair, and he's flipping through a book of those Ishihara (aka dot) plates seeing nothing on most of them, or a later visit and trying to do the arrangement test and a bunch of the squares look to be the same color. There is just something about those pink/baby blue/light green colors. Me, a devastated teen, "Mom, he told me I am BLIND!?" Here, for example.. This color arrangement test, to me looks about correct. (the block on the left-most was already placed). I have done the test a twice today and it's looking better, but at some point, I have to start to guess. For you that are not color blind, you can see my obvious mistakes, but according to the site, I am mixing up my colors still. Now, it could be I don't know how to do the test.. :) (or is it sooo obvious?).. Color blindness has impacted my gameplay, even if only a little. For example, games like Bejeweled (aka Candy Crush) where there are a lots of items the similar shapes, just with slightly different colors. Want me to solve this with only X moves? I really need to focus on those shapes. (As a note, candy crush has distinct enough shapes that I seldom need the color). When playing co-op Borderlands, I had issues with throwing out legendary gear. Cleaning out bags.. "Didn't you want that legendary pistol?" Oh maybe. So, these (highlighted) aren't the same color?? In Warcraft, I've never really had major issues. I typically can work around that the green and yellow gear is virtually the same color by evaluating the gear for it's stats, not based on the implied quality. Now with AMR, I don't even try to do the maths. "this looks like an upgrade, but what does Mr. Robot say about it..". Yeah, I know, but I don't find theorycrafting fun.. I am interested to see if it changes the game any for me. 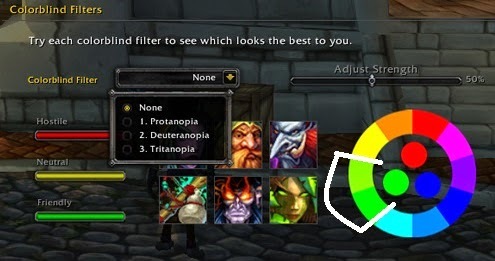 Will the new colorblind filters improve my gameplay any? Or will it be like the van Gogh comparison's and I won't see any difference. 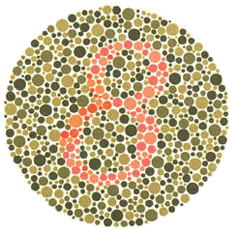 I too am color blind so I know exactly what you are going through. I can not tell the difference between blue and purple gear, they look the same to be. Thankfully the item level tells the story these days. But I have come across many problems, very few major, with colors in the game. I like that they are adding the color blind help to the game but based on what I have seen so far, it doesn't look like it would help me much. Either that or all the places decided to use very bad representative examples. Like the one on the front page of MMOC a while back with 4 images showing how different you can make things. I looked at it and said, 3 of the same image and one different, how does this help? At least blizzard is trying. I've been putting in tickets here and there over the years every time I run across something that was really an issue due to me being color blind. I just don't think this will help me much sadly. Hope it works for you. I tweaked my settings last night and found it 'helped'. It seemed though that it 'washed-out' all my other colors. So while I can now see the differences between the yellow and green squares, it's like the brightness is way too high. Which is possibly true as well, thinking back on it.